Dr. Ostfeld is Senior Scientist at the not-for-profit research institution in Millbrook, New York, dedicated to providing the science behind environmental solutions. His research focuses on ecological determinants of human risk of exposure to infectious diseases, with an emphasis on Lyme and other tick-borne diseases. Congressman Gibson has led the effort in Congress to raise awareness of Lyme disease and boost funding for research. 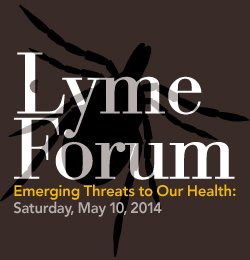 During his two terms, he has supported and succeeded in protecting critical Lyme Disease research funding; has served as Co-Chair of the Lyme forum held at Skidmore College; passed language in the House Appropriations committee two years in a row supporting Lyme research at the Agriculture Research Service and National Institute of Food and Agriculture (NIFA); and introduced bipartisan legislation (HR 610) to establish a federal Tick-borne Advisory Committee. Under the legislation, the Advisory Committee would be tasked with enhancing communication among federal agencies, medical professionals, and patients/patient advocates and to ensure that a broad spectrum of scientific viewpoints is represented in public health policy decisions. The bill also requires that the information disseminated to the public and physicians be balanced. Michael Singer was News Director at KCBS Los Angeles, where he won a Peabody Award for investigative reporting. He was a CBS Network News Producer and he made documentaries for NBC and MSNBC. He was a freelance journalist, published in New York Magazine and The Village Voice, among others. He worked as an analyst for Medley Global Advisors, a private financial and political research company. Retired, he is now finishing a novel.